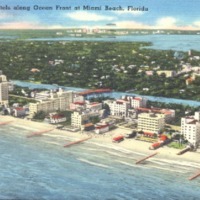 A postcard depicting hotels along Miami Beach, Florida. The present-day area of Miami Beach was originally inhabited by the Tequesta. In 1870, Henry Lum and Charles Lum purchased a land grant for the area and set up a coconut venture. After the new business failed, the Lums eventually sold the land to John S. Collins and Thomas Pancoast. In 1913, with money loaned from Carl Fisher, Collins began constructed a bridge that would connect the island of Miami Beach to the Miami mainland. At the time of its completion, the bridge was the longest wooden wagon bridge in the world. Two years later, Miami Beach was incorporated as a city and J. N. Lumus was elected its first mayor. The city enjoyed a real estate boom over the next couple of years, when Millionaire's Row, a three-mile stretch of mansions, was developed. During World War II, the Miami area was used as a training center for the U.S. Army Air Corps, resulting in post-war population growth. South Florida experience another spurt in population growth when hundreds of thousands of people fled Cuba, following the takeover by Fidel Castro (1926-). In 1979, Miami Beach's Art Deco District, also known as South Beach or SoBe, was added to the U.S. National Register of Historic Places. Digital reproduction of original 9 x 14 centimeter color postcard by Tichnor Bros., Inc.
Miami Beach Collection, Duval County Collection, RICHES of Central Florida. Originally created by Tichnor Bros., Inc. and published by the Harrison Photo Laboratories. Bramson, Seth. Miami Beach. Charleston, SC: Arcadia Pub, 2005. "History of Miami Beach." Miami Beach Latin Chamber of Commerce. http://www.miamibeach.org/directory/living/history-of-miami-beach. Tichnor Bros., Inc.. “Luxurious Hotels Along Ocean Front at Miami Beach Postcard.” RICHES of Central Florida accessed April 22, 2019, https://richesmi.cah.ucf.edu/omeka/items/show/7571.